Here's another dish my friend Johanna made for our Chilean wine & dinner event. 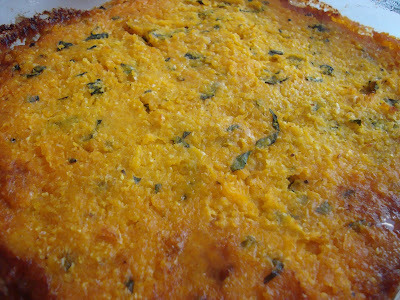 This is a great dish that's reminiscent of shepard's pie with a South American flair. Brown ground beef. Add onion, cumin, oregano, salt, pepper and raisins. Cook slowly until brown. Place in buttered casserole. Arrange egg slices on top of meat. Chop frozen corn in blender until paste-like. Cook slowly in small amount of oil over low heat, adding milk to prevent burning or sticking. Season with salt and pepper. Spread corn mixture over meat and egg layers. Sprinkle with confectioners' sugar. Bake at 350 degrees F until browned.